Where do I use my Ghost Bikes voucher code? You can discover a huge selection of products at Ghost Bikes including a variety of helmets like full face helmets, flip up front helmets, open face helmets, convertible helmets, motocross helmets, adventure helmets, trials helmets, karting helmets, goggles, helmet accessories and spares. You’ll also find a collection of boots including race and sports boots, touring boots, motocross boots, urban and casual boots, cruiser boots, adventure boots, ankle boots, trials boots, supermoto boots and over boots. Or if it’s gloves you’re after you’ll find race and sports gloves, short and street gloves, touring gloves, motocross gloves, mechanic gloves, cruiser gloves, heated gloves, inner gloves and over gloves. Ghost Bikes also stock a huge selection of biker clothing for both men and women. This selection includes jackets, trousers, motocross jerseys, motocross pants, kits and bundles, balaclavas, masks and tubes, layers and underwear, mid layers, trials clothing, leather and suits, accessories, clothing care and casual wear. As well as this you can also find all kinds of accessories like armour, luggage, security, electronics, maintenance, bike accessories and miscellaneous from huge names like Abus, Bell, Fox, Knox, Shock and Merlin. In the Ghost Bike online store, you’ll find a huge supply of parts and spares for your motorcycles and motocross bikes. These parts and spares include batteries, bodies and frames, brakes, brake pads, cables, chains, sprockets, complete engines, cooling systems, decals and stickers, electrical and ignition products, engine parts, exhaust systems and parts and much more. They have a huge array of filters, fuel systems, handlebars, foot pegs, instruments, gauges, levers, lights, indicators, mirrors, seats, seat covers, screens, tyres, tubes, wheels and wheel rims. All these parts and spares are extremely affordable and come from top brands in the motor industry, so you can buy with peace of mind that you’re investing in top quality equipment that won’t let you down. Enjoy all the latest and hottest deals from Ghost Bikes in their sale section. Grab yourself a bargain while you can, as the stock moves fast, and discover new discounted items each day from huge brands like Black, Caberg, Fly and Interphone. The sale section holds all the clearance and end of line products that must go, allowing you to enjoy massive savings on everything motocross and cycle including motorcycle helmets, motocross helmets, motorbike boots, touring boots, MX boots, on and off road gloves and biker and moto-X clothing, as well as a full range of handy accessories. Ghost Bikes provide customers with a massive selection of motorcycle and motocross helmets, gloves, clothing, armour and accessories from top brands like O'Neal, LS2, Wulfsport, Shoei, TCX, Spada, Givi, Richa, Sidi, Rev'It, Caberg and Shark, as well as an array of their own high quality, own branded products. 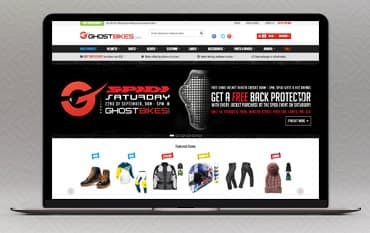 Shop online at Ghost Bikes for motorcycle and motocross products from all these top brands and use a GhostBikes.com discount code from us to save money on your order. All the products available also come with the lowest price guarantee and unrivalled customer support.